When I was asked to photograph the LGBB (lesbian and gay big band) I thought it would be perfect for this assignment My planning included how the band would use the photos as well as this assignment brief. The band is newly formed and wanted photos for their website as well as publicity photos for their first gig. For this assignment I needed to take pictures "would focus on telling moments and on explaining the activity." As part of my planning I called on past experience. I have taken pictures of a dance group so I knew that lighting and movement were the two areas that are the most difficult to get right. It is also not possible to use flash at a performance, so I needed a fast lens and a high ISO. The first session with the group was at their rehearsal. The arrangement they had meant I was not able to check out the space beforehand so this was a real challenge to planning. They had told me it was a basement and very small. I figured that would mean probably very dark as well. Sixteen musicians and me in a space about the size of a small bedroom was definitely challenging. The space was too small and cramped for me to use a tripod. I know that I have a bit of camera shake if the shutter speed gets too slow for the lens. I took two lens with me 24-105 with a widest aperture of f4 and 70-200 f2.8. I have found the 24-105 does not perform well at the widest aperture so I don't like to open it up below f5. This meant that a high ISO was my only other option. For the first part of the session I shot at 1600. As the afternoon wore on I had to increase this to 3200. At this top end I did find the pictures had considerable noise. Again because of the cramped space I concentrated on close-up pictures of hands and instruments. At the end of the session another room at the venue, that a drama group had been using, was available to us for 20 minutes. I used this for group shots. However it was very dark by then and my one flash without a light stand wasn't successful. I found it incredibly difficult to organise a large group for a portrait. It was even worse when I looked at them later on my computer screen. People were looking in various directions. I had used my 24-105 at the widest setting, so the people on the edge of the frame were distorted. I had also had to take the ISO up to 6400. Overall the group shots were not successful. The confined space forced me to take close up and detail shots, sometimes at awkward angles, these shots were the most successful. An example is the hands on the keyboard (middle photo first row below). The band was happy with the photos I gave them and asked me to photograph their first gig. Knowing that I would not be able to use flash during the actual performance I arranged to photograph them before the event. I researched the work of music photographers over the next couple of weeks. I could not find any images of big bands as a group. I found a lot of work of jazz musicians, the majority of which were not taken during the performance. I looked at the jazz photography of Francis Wolff, Herman Leonard, Johnny Monk and China Moses. The majority of the work I studied, concentrated on individuals. It was black and white film and mostly staged photos. The day of the gig came round and my plan was to take the majority of pictures before the performance. I had a flash and a constant LED light and light stand. I also had a ring flash that fits over my flash unit. I had my tripod. What I was confronted with this time were disco lights. Yellow, pink, green, blue. My first response was to try and get them turned off or at least controlled. Not possible. My second option was to try and make them work in an arty way. It is a gig lighting is not meant to look like the street. For some of the pictures this was an ok approach. For the majority it did not work. I had green faces and this is not arty it just looks awful. I figured I could convert to black and white in post production and tried to keep this in mind for difficult shots. What this meant was looking for tones, shapes and contrasts that would look good in black and white. I was not successful in the group shots again. Trying to fit everybody in the frame without distracting edges to the picture was a problem. They also lacked vibrancy which on the day I couldn't figure out why. Analysing my work since I've realised that they are all concentrating on their music sheets in front of them, there is no energy coming from the group. Taking another look at a variety of jazz photos was what made me realise that the music sheets and stands were the problem. The vibrancy comes from the relationship with the audience and/or the photographer. I am planning some new ways of taking pictures for the next event where I will stage manage some shots without music sheets and stands and encourage them to relate to an imaginary audience. Putting a selection of images for this assignment I have tried to give a sense of the music and energy of the group. I converted them all to black and white as a mixture of colour and black and white does not flow. I also think black and white has a more jazzy feel. I'm happiest with my close up and detail pictures. The first three are my favourites of the selection presented below. I've used close up and angles to add interest and vibrancy. This next three are focusing on the people. The next three are all staged shots. 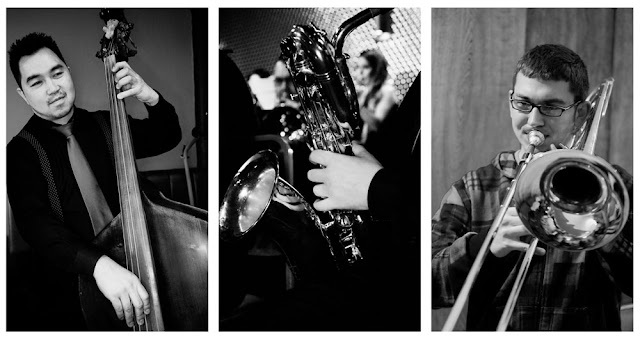 I was influenced by the old style jazz photos when trying to put these together. The last three I've worked on featuring the instruments that really give a sense of the music of a big band. In summary I would like to imagine that anyone looking at my pictures would think "this is a band I would like to see and listen to"